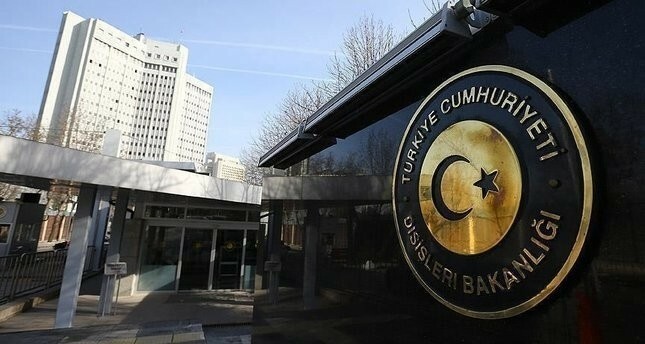 The Turkish Foreign Ministry slammed late Monday the Israeli and Egyptian ambassadors accredited to the Greek administration of southern Cyprus late Monday for supporting the Greek side's unilateral hydrocarbon exploration in the eastern Mediterranean at a recent conference, urging the diplomats "not to exceed their authorities." The ambassadors of both countries threatened Turkey last week with "military intervention," with Israeli ambassador Sammy Revel saying "I hope Israel will not have to carry out a military intervention against Turkey" over Turkey's reaction against south Cyprus' unilateral gas exploration activities. Egyptian ambassador Mai Taha Muhammad also threatened to use military force against Turkey "if needed." U.S. ambassador Cathleen Doherty also voiced support for both of the diplomats, claiming that Turkey's attitude over the matter was "unacceptable." Calling the ambassadors' remarks, which supported the unilateral drilling being conducted by the Greek Cypriots in the Mediterranean, "unwarranted", the ministry said it was "unacceptable" that the Greek Cypriot side continued to act as it was "the sole owner of the Island" all the while "a just and lasting settlement" remains to be achieved. "With these activities, the Greek Cypriot side disregards the inalienable rights on natural resources of the Turkish Cypriots, who are the island's co-owners," he added. Aksoy said this attitude is far removed from any spirit of compromise and demonstrates that the Greek Cypriot administration has failed to grasp the win-win potential for economic cooperation that could result from a settlement that both the Turkish Cypriot side and Turkey have been making the "utmost" effort to achieve. "The authorities of the Turkish Republic of Northern Cyprus (TRNC) and Turkey have, from the very beginning, been issuing the necessary warnings with regard to these irresponsible steps taken by the Greek Cypriot administration and voicing their justified concerns and indignation," Aksoy said. He said Turkey is determined to protect the rights and interests of Turkish Cypriots and to continue supporting them. Aksoy added that Turkish Foreign Minister Mevlüt Çavuşoğlu, at a joint press conference last week during his visit to the TRNC with Turkish Cypriot President Mustafa Akıncı, once again openly stressed Turkey's determination to protect the rights of the Turkish Cypriot people. Cyprus has been divided since 1974 when a Greek Cypriot coup was followed by violence against the island's Turks, and Ankara's intervention as a guarantor power. It has seen an on-and-off peace process in recent years, including the latest initiative in Switzerland under the auspices of guarantor countries Turkey, Greece and the U.K., collapsing in 2017. Turkey blames the Greek Cypriot intransigence for the failure of the talks, also faulting the EU for admitting the Greek Cypriot administration into the union in 2004 although Greek Cypriot voters had recently rejected a peace deal. Greek Cyprus has been trying to exclude the Turkish Republic of Northern Cyprus (TRNC) and Turkey, which has been conducting seismic surveys in the area and exercising its legal rights in accordance with international maritime law. The government in the south of the island has repetitively and unilaterally commissioned international energy giants like Italian ENI and French Total for hydrocarbon exploration. Ankara's reactions and measures in the area have previously prevented these moves since it considers them to be a violation of the sovereign rights of Turkish Cyprus. Turkey argues that it is protecting the rights derived from the international maritime law by preventing any unwarranted exploration in the area. According to the international maritime law, national territories have a continental shelf up to 200 miles while the islands have territorial waters extending up to 14 miles and some of these blocks; for instance, Block 6 in the unilaterally declared exclusive economic zone (EEZ), corresponds to Turkey's continental shelf. In 2011, the Turkish Cypriot government called on the southern administration to cease operations run by multinational energy companies like Noble Corporation in the EEZ, whichhad been single-handedly declared without the inclusion of the north in previous negotiations. Turkey's seismic vessel Barbaros Hayreddin has been conducting surveys in the region since 2015 when the two sides signed an agreement that gives Turkey exploration rights for 30 years.